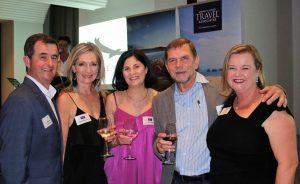 Kennedy & Turner Travel Associates recently celebrated the 20th Birthday of Travel Associates with an evening of cocktails and canapés at the Calile Hotel, Fortitude Valley, Brisbane. Kennedy & Turner Travel Associates’ owner Jo Kennedy, along with her team, Sally Watson, Helen Bedingfeld, Tanya Gibson and Amy Roach, celebrated with guests and clients. Guests enjoyed cocktails and canapés at the Calile Hotel as they were introduced to very special Virtuoso Industry partners including Uniworld, andBeyond, Rocco Forte Hotels, COMO Hotels, Crystal Cruises, Captain’s Choice and Emirates. The evening was full of travel inspiration whilst being entertained by Brock Ashby from The Voice, before a surprise draw of nine prizes totalling $40,000 from the Virtuoso partners. Wayne and Bonnie Messer won the grand prize from &Beyond, including three nights at &Beyond Vira Vira in Pucon, the Lake District of Chile with the full experience, inclusive of accommodation, all meals, all beverages including a wide selection of Chilean wines, excursions and all activities and road transfers to/from Temuco Airport. Jo Kennedy opened Kennedy & Turner in 2000 and became a Virtuoso member in July 2015. Over 18 years of operation, Jo has received a number of awards, including No 1 Consultant in Australia, No 2 Globally for Leisure, NTIA Finalist Award 2017/18 and FCTG Global Hall of Fame 2018, awarded in Berlin July 2018.